Taylor Made Stallions has set its 2019 stallion roster and fees, led by California Chrome who will stand the upcoming breeding season for $35,000 S&N. A two-time Horse of the Year and seven-time Grade 1 winner of $14,752,650, California Chrome scored his biggest victories in the Kentucky Derby and Preakness Stakes as a 3-year-old and the Dubai World Cup and G1 Pacific Classic in 2016. All told, he won 15 stakes in his illustrious racing career, including 10 graded, from 27 starts. His first in-foal mares sold up to $250,000 last year at Keeneland November and he has first weanlings this year. 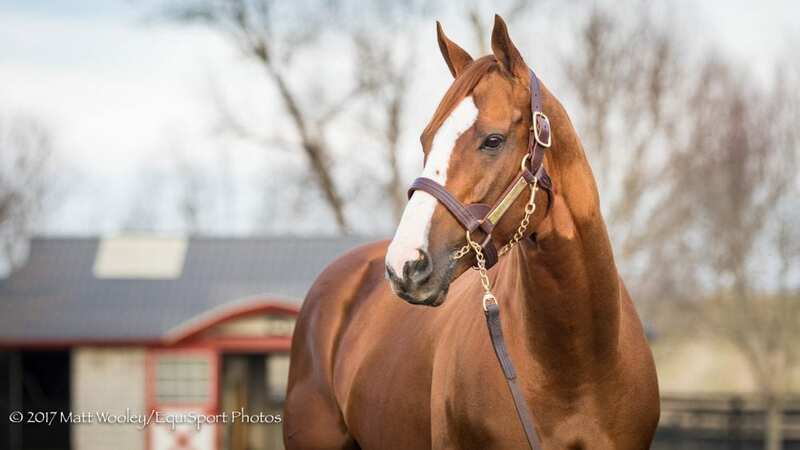 Like California Chrome, Not This Time also has first weanlings and is already represented by a $100,000 first-crop colt at Fasig-Tipton's Saratoga Fall Sale. The most brilliant 2-year-old ever by sire of sires Giant's Causeway, Not This Time, a runaway winner of the G3 Iroquois Stakes and runner-up in the Breeders' Cup Juvenile, is out of the Trippi mare Miss Macy Sue, a graded stakes winner and Breeders' Cup-placed earner of $880,915, making him a half-brother to Breeders' Cup Dirt Mile winner Liam's Map. Not This Time's fee remains unchanged at $15,000 S&N. Mshawish and Midnight Storm will both stand for $10,000 S&N. Medaglia d'Oro's only Grade 1 winner on dirt and turf and his fastest dirt miler, Mshawish earned $2,421,351, with five total graded stakes wins, including back-to-back wins on dirt in the G1 Donn Handicap and G3 Hal's Hope Stakes. He has first weanlings this year. Midnight Storm is a brilliantly-fast Grade 1 winner from North America's hottest sire line. By Pioneerof the Nile, Midnight Storm is a seven-time Graded stakes winner with victories in the G1 Shoemaker Mile on turf and the G2 San Pasqual Stakes on dirt en route to career earnings of $1,783,110. He stood his initial season at stud this year and first foals arrive in 2019. Graydar, a leading second-crop sire, rounds out the roster at a fee of $7,500 S&N. The Grade 1-winning son of Unbridled's Song was a brilliant winner of the G1 Donn Handicap and is the sire of graded stakes-winning 3-year-old colt Lombo, winner of the G3 Robert B. Lewis Stakes, 2-year-old stakes winner The Grey Dehere and stakes-placed Aggregator and Palladium. This entry was posted in Bloodstock and tagged 2019 stud fees, California Chrome, graydar, midnight storm, mshawish, not this time, Taylor Made Stallions by Press Release. Bookmark the permalink.